Doping in sport is not new; athletes have taken performance-enhancing substances since time immemorial. Despite advances in the detection-deterrence model, where individual athletes are targeted through standardized testing, and increased efforts to harmonize anti-doping policy and practice through revisions to the World Anti-Doping Code, doping continues to threaten sport by violating its underpinning values. Most recently, this threat has been fortified by serious allegations of systematic doping in Track and Field Athletics in Russia. Closer to home, 47 athletes and/or athlete support personnel are currently serving anti-doping rule violations. Sport doping is now such a regular feature of global news feeds that we must radically reconsider the value of the detection-deterrence approach for making sport drug-free. In this lecture, Susan considers how a mounting body of social science research supports this stance, as does the emerging discourse that favors replacing ‘anti-doping’ with ‘Clean Sport’. Allowing for doping having many facets, this lecture explores the specific contribution of social psychology to contemporary understanding. 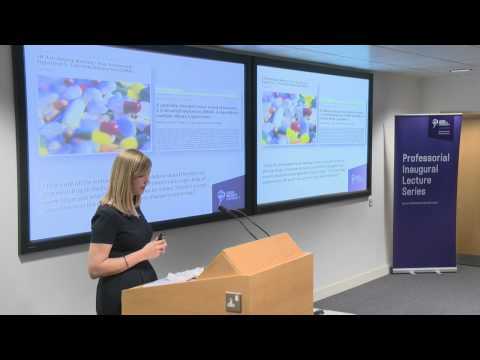 In doing so, Susan shares examples of the research undertaken at Leeds Beckett University that have contributed to the evidence-base that has informed national, international and global anti-doping policy and practice. Susan Backhouse is a Professor of Psychology and Behaviour Nutrition and Head of the Centre for Sports Performance in the Institute for Sport, Physical Activity and Leisure at Leeds Beckett University. She is a British Psychological Society (BPS) Chartered Sport and Exercise Psychologist and a Health and Care Professions Council Practitioner Psychologist. Susan completed her first degree in Physical Education and Sport Science at Loughborough University in 2000 for which she was awarded the Victor Sibley Memorial Prize for Outstanding Academic Achievement. Following this, Susan accepted a PhD Scholarship to work with Professor Clyde Williams and Professor Stuart Biddle investigating nutritional influences on affective responses to exercise. Susan joined Leeds Beckett University in 2003 as a temporary Lecturer in Sport and Exercise Science. Since then she has moved through the ranks becoming a Senior Lecturer in Sport and Exercise Psychology in 2005, Reader in 2008 and Professor in 2014. In 2005 Susan was awarded a Promising Researcher Fellowship to work alongside Dr Paddy Ekkekakis in the Department of Health and Human Performance at Iowa State University. It was during that time that she drew inspiration from her voluntary role on UK Athletics Anti-Doping Policy and Support team and submitted a funding bid to the World Anti-Doping Agency to undertake a systematic literature review. The findings of this review initiated a pioneering programme of research on the social psychology of drugs in sport; establishing Leeds Beckett University as a global research leader in the anti-doping field. Susan’s collaborative approach to research has founded links with internationally renowned doping in sport researchers and prominent sporting bodies, such as the World Anti-Doping Agency, the Rugby Football Union, UK Anti-Doping, UK Athletics and the International Athletics Federation. In 2012 Susan was invited by the European Commission to join their expert working group on doping prevention; giving rise to EU wide recommendations on the prevention of doping in recreational sport. In 2014 she became a member of UK Anti-Doping’s Research Steering Committee and she convened the British Association of Sport and Exercise Sciences Clean Sport Interest group. Susan has published over 50 peer-reviewed journal articles, commissioned research reports, editorials and book chapters and she is an Associate Editor for Performance Enhancement and Health.